While most who “flip” their courses are scientists or social scientists, as Claudia Thompson observes, I am one of the minority—a language instructor, who has flipped her introductory Latin and Ancient Greek courses. 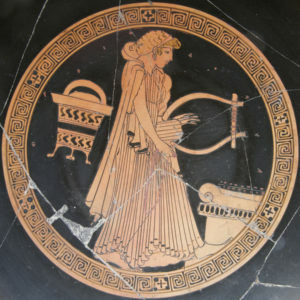 As “dead” languages, Latin and Ancient Greek tend not to be taught as modern languages; instead, instructors commonly lecture in English about points of grammar and syntax—an intensive and laborious process that leaves few opportunities for students to engage in varied course activities, or have access to a professor who can correct their errors as they grapple with new (and old) concepts. While I have changed my teaching in many ways over the years, flipping the class has given me that most precious commodity—time. My students typically view a screen cast twice a week as part of their homework. All the content I deliver could easily be read in their books, but Latin and Greek textbooks tend to be nothing like modern ones—few images, dense explanations of grammar, and lengthy lists of unfamiliar terminology. The screen casts allow me to highlight what is essential, offer different examples, use colors or images to illustrate points, and make the content more accessible. Students are required to submit questions about the content a couple of hours before the beginning of class. This constitutes a small portion of their overall grade, but more importantly allows me to shape the class period to address directly any problems or confusion. The digital content has the added benefit, as Thompson also observes, of allowing students to view the material multiple times—as they often do before tests. The video lecture also frees me to do things I never had time for before—especially to employ active learning strategies that help them build and retain knowledge. Students play games, compose stories, write skits, and read graffiti. I can afford time to speak slowly to them in Latin as I explain the next activity, because I don’t have to deliver content. Students now quickly learn each other’s names, because I can make them do multiple group activities daily. They are more engaged in class and more willing to volunteer. Has this resulted in better scores overall? This is nearly impossible for me to answer, largely because when I threw out the baby (traditional lecture), I also threw out the bathwater (the old textbook, old assessments and most of my old pedagogy). Yet, there is one area where I think it has made a significant difference: student retention beyond the first year. As in many language classrooms, most students are there to fulfill their language requirement; few intend ever to continue. So, this is my only opportunity to show them a fragment of the wonders of the ancient world, and I used to squander so much of it explaining the intricacies of grammar. The time I gained I now use to make these ancient people real—we read and discuss what the Romans thought about foreigners and refugees, what Athenians thought about adultery, how ancient peoples lived or cooked or what their toilets looked like. These forays into the culture and history of the peoples whose languages I teach have sparked interest in students who were only there because they mistakenly thought that no one speaks a dead language. And the immediate feedback they get in class means that students see themselves as succeeding in the day-to-day of our time together. It wasn’t the “flipping” that won them over, but rather that flipping has allowed me to share more about these fascinating societies, which has seduced a few more to the level beyond.